Marcus Maddison is down and he's not getting mush sympathy from Plymouth defender Sonny Bradley and goalkeeper Luke McCormick by the looks of it. Photo: Joe Dent/theposh.com. Ah football, we’ve missed you. Play-acting players, misbehaving players, players using social media (what else?) to accuse other players of foul deeds. managers delivering one-eyed match reports and a visiting manager so lacking in self-awareness he should take up politics. Jack Marriott (left) and Leo Da Silva Lopes celebrate after the first Posh goal. Photo: Joe Dent/theposh.com. After the match Plymouth boss Derek Adams moaned, with some justification, about the possibility of a foul in the build-up to what turned out to be the crucial second Posh goal. He then moaned some more about ‘the disappointing way Posh players went down injured and then took so long to get up’. Presumably he had Marcus Maddison and Anthony Grant in his sights, but coming from the man who last season admitted using Home Park ball boys to slow the game down it was a bit rich. Anyway Maddison, who apart from a 10-minute spell in the second-half was an ordinary presence on the pitch, grabbed the headlines for a different reason with a surprising accusation of spitting towards a unnamed opponent on Twitter not too long after the final whistle. It was a niggly old game punctuated by numerous free-kicks, but aside from the odd petulant skirmish, it was the usual rough and tumble found in the lower leagues. One hopes whatever Maddison felt was accidentally administered or incorrectly diagnosed, but going public in such an unofficial way was an error of judgement which only managed to deflect attention away from the excitement of an opening day win. Seventeen year-old Idris Kanu comes on to make his Posh debut in place of Junior Morias against Plymouth. Photo: Joe Dent/theposh.com. Listening to rival managers after a match is occasionally amusing, often confusing and can have the effect of questioning one’s own view of what had just taken place. McCann said his side deserved to win and it could have been three or four nil, while Adams claimed his side were ‘thoroughly outstanding’ and ‘far better than Peterborough’. The truth, as always, was probably somewhere in the middle and a draw might well have been the fairest result. Both sides were denied further goals by superb goalkeeping, although the saves made by home debutant Jonathan Bond were far more crucial to the outcome. Bond made a wonderful double stop to thwart Joel Grant and Antoni Sarcevic in the first-half when Posh were leading 1-0 and then stretched athletically to keep out Jake Jervis and Greg Wylde when Plymouth were pressing hard to get back in the match at 2-0 down. Posh had struck early in each half to establish what turned out to be a winning lead. Posh chairman Darragh MacAnthony wants 110 goals from his team this season and he only had to wait four minutes for the first when a cross from Leo Da Silva Lopes struck visiting defender Gary Sawyer and rebounded into the Argyle net. Two minutes into the second-half Jack Marriott dispossessed Sonny Bradley - unfairly according to many - before crossing for Junior Morias to make it 2-0. In between those strikes Argyle enjoyed slightly more possession, but goal-scoring didn’t come that easily in their League Two promotion season and it wasn’t difficult to see why here, although the early departure of sole striker Ryan Taylor didn’t help. 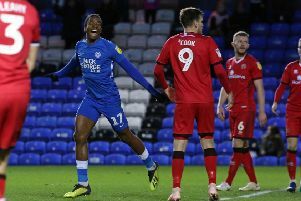 Posh had appeared to weather the storm and were playing their best football of the match in the 10 minutes leading up to Argyle’s consolation goal. Maddison decided to enter the fray and first set up Michael Doughty and then helped create a chance (with the help of a back post header from Gwion Edwards) a great chance for Marriott, but McCormack made terrific blocks to keep his side in touch. And with 20 minutes to go the match was blown wide open when Maddison was challenged strongly midway in the Argyle half. He stayed down, Argyle carried on and Graham Carey and Lionel Ainsworth set-up substitute Gregg Wylde for a tidy finish. Posh shut up shop effectively after that with their three centre-backs Jack Baldwin, Ryan Tafazolli and Steven Taylor happy to put their bodies on the line. A great start then, but one which hinted at future problems with this 3-4-1-2 system as Tafazolli and Taylor could well get exposed by the gaps left by wing-backs encouraged to play in very advanced positions. But Anthony Grant, a man who must be infuriating to play against, and Michael Doughty looked to be a decent central midfield pairing. Marriott and Morias has potential as a strike pairing and 17-year-old Idris Kanu didn’t look out of place in his 25 minutes on the pitch.